After two days of competition, the finals for Saturday night’s Red Bull Crashed Ice Downhill World Championship are down to 64 remaining competitors. Thursday night saw 32 Americans qualify for Friday afternoon’s elimination round. They joined 32 skaters from the international competition who had competed earlier in the day. Those who finished 33-64 competed in the Friday afternoon affair, while the first 32 automatically advanced to Saturday night’s competition. The competition on Saturday will have a decidedly North American look to it, as 18 Americans and 17 Canadians will be among the group of 64. Ten Canadian skaters had qualified earlier in the day, including Dean Moriarity, who had the best qualifying time at 42.40. Dean’s brother Dylan also advanced, as did fellow countrymen Scott Croxall. Croxall finished in second in last year’s event, and finished third in the Shootout round. American hopefuls Cameron Naasz, Reed Whiting, and Tyler Witty were three of six that advanced in the early afternoon competition. In the knockout run Friday afternoon, the American’s shined, as 12 qualified to advance to Saturday night’s event. Leading the way was Tommy Mertz, who easily won the fourth qualifying heat, beating second place finisher Derrek Coccimiglio by at least 50 feet. Coccimiglio advanced as the second place finisher in the heat. In the first heat of the competition, Tyler Witty’s brother Ryan held off Sweden’s Jasper Felder to take the heat and advance. American Colin Mayer then won heat two, with the Netherland’s Danny Hansen finishing in second. That was followed by a sweep by Canadians Daniel Guolla and Jeremie Bergeron to reach the final elimination stage. Next was Heat 4, a round that Mertz dominated from the beginning. Using a great start out of the gate, the American took a commanding lead about 250 feet into the competition and never looked back. His performance was a foreshadowing of dominance by the United States in the next two heats, as Josh Gabardi won Heat 5 and Matt Johnson took Heat 6. American Adam Green, considered a true challenger in this competition, advanced by placing second in Heat 5, and Russia’s Pavel Kryukov took second in Heat 6. Heat 7 saw Finland’s Antti Tolvanen become the fifth Finnish competitor to advance. Switzerland’s Manuel Mehli finished second, making him the fifth Swiss skater to reach Saturday’s round. Heat 8 was won by Fabian Mels, making him the second German skater to move on, joining Martin Niefnecker, who finished 20th in the International Shootout earlier in the day. Switzerland’s Reto Maeder finished second. Heat 9 saw Denis Novozhilov from the Russia win, with American Tory Merz finishing in second. Two Canadians, Tyler Roth and Gabriel Renau would then sweep Heat 10. Heat 11 would be won by Novozhilov’s countryman, Andrey Lavrov, with Gabriel Andre from Canada finishing in second. Heat 12 saw two competitors become the first entrants into Saturday’s round from their respective countries. Scotland’s Callum Boyd won the round, with Estonia’s Mark Taru coming in second. It was an exciting race that saw the two narrowly defeat Americans Craig Johnson and TJ Ridley. That brought up Heat 13, which was led by Sweden’s Michael Johansson since the first set of rollers, but on the last jump he slipped on his landing, allowing American Jonny Palmeri and Canada’s Shayne Renaud to pass him, sending the two North Americans onto the next round. In Heat 14, the U.S.’s Jordan Lalor took the heat, narrowing out Lukas Kolc. Kolc became the second competitor from the Czech Republic to advance, after Michael Urban finished 18th in the International Shootout. 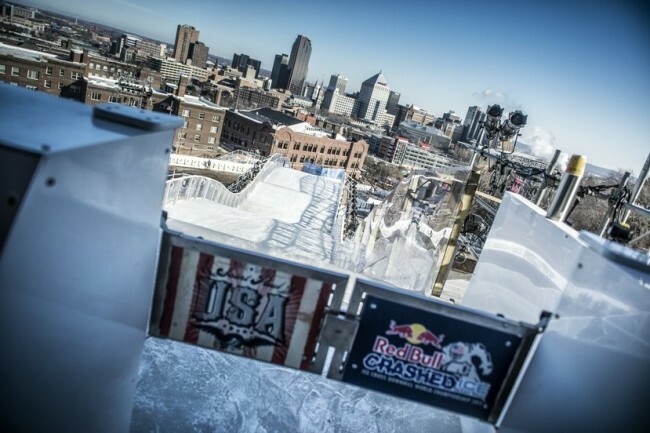 Heat 15 was won by Sweden’s Wisam Gharzoul, with the U.S.’s Joe Schaffer finishing second. Americans Luke Halvorson and Mitchell Teisberg claimed the last two spots, finishing 1-2 in Heat 16. These 32 will now vie for the title on Saturday night, starting at 6:30 PM in St. Paul, MN.